If you guys have never heard of Vegan Cuts, they are a vegan company, like a market place, that has monthly subscription boxes both the snack box and the vegan beauty box. You can also go to their online store to purchase awesome items at a discounted price. The beauty box specifically, has 4-7 items (ALL VEGAN and cruelty free!). The subscription is $ 19.95 a month and in my opinion, its very well worth it for the amount of products you get which almost always are more expensive than 19.95 overall. So this lovely company was kind enough to contact me and ask if I would review one of their beauty boxes on my blog and of course I said yes and anxiously awaited its arrival. I thought it was so sweet how the products were packaged and how neatly everything was placed. There were so many products I couldn’t wait to try them! The Facial Moisturizer: This smelt so good! It made my skin feel so smooth and very evenly. The cream wasn’t oily at all, which was really great because lets face it…Who likes cream that makes their face look all oily and sweaty? The Vegan Lash Mascara: This was probably my favorite product out of the whole box. I don’t have vegan mascara because Its far too expensive and I don’t use it so when I saw this I got so happy. It works so well, I can’t even begin to explain. Gives you eyelashes tons of volume and length and I definitely recommend this product. Jojoba Oil: I used this at night on my face and it left my skin feeling so smooth. Sagga Charcoal Face Cleanser: This product was absolutely amazing. I felt it really cleansed my face at night and it felt great “treating” myself to a little face mask before bed. We all need those nightly face masks after a hard week am I right? The Body Scrub: This was a little sample of body scrub and as soon as I opened it the smell definitely won me over. Its smells like essential oils and works like a charm to get rid of dead skin. Last but not least, Jojoba Gentle Cleansing Balm: I used this at night before bed to get rid of my makeup and it works really well. I rinse it off with warm water and usually follow it up with the Jojoba oil or the moisturizer. My overall opinion, This beauty box was amazing and I definitely recommend it! I loved each and every product and it was so nice to get to try things that I never have before. Check out Vegan Cuts to purchase your first box if you are interested! I can’t say enough things about this awesome company. Thank you guys so much for sending me such a lovely box with goodies I get to use daily! This is one of my favorite snacks/meals. Its so simple to make and extremely delicious. Chia seeds have endless benefits! They add a healthy boost of omega-3s and healthy fats into your diet and they keep you feeling full and energized for quite an extended period of time. You can also use seeds as a vegan egg substitute! It holds things together extremely well. Lets get to this simple and easy recipe! Any other sweeteners you’d like but the banana really sweetens it up a lot! Put in the fridge (I usually make this overnight or make it in the morning as a snack before bed) and you can stir every couples minutes to make sure the chia seeds absorb all the milk. Take out of the fridge when you want it, top with whatever your heart desires! In my chia pudding I added more sliced bananas, strawberries and topped it with a Go Raw Spirulina Bar. If you want to be fancy you can definitely layer it all pretty. There are sooo many variations to this recipe but this is just one of my favorites. Let me know if you guys try this 🙂 It makes for a great power packed meal or snack for breakfast/post workout or a snack! Hello friends…Its been a hot minute since I posted last and I’m extremely sorry for that. I suppose life got into the way and I didn’t have time to much much on here anymore. But I am back and I’m ready to begin my blogging journey 🙂 I thought I would give you all a little update of what I’ve been up too and what my plans are for this blog. Since we last spoken I have gotten my yoga teacher training certificate and am now a certified yoga instructor! I also have finally chosen my career path and have decided to enter the nutrition & dietetics field. I found myself going back and fourth between majoring in nutrition for quite some time and I’m finally listening to my intuition and going with my gut. Next year I will hopefully transfer to a new college that has a dietetics major. I am very excited for this 🙂 On the other hand, I have gotten into more strength training and weight lifting which has been super exciting and very inspiring to see my body change and my muscles start to grow. So my plans for this blog are to get back to posting more about fitness/recipes/daily thoughts/workouts/recovery/reviews. A spew of it all! Let me know what you guys are interested in 🙂 I’m back for good! 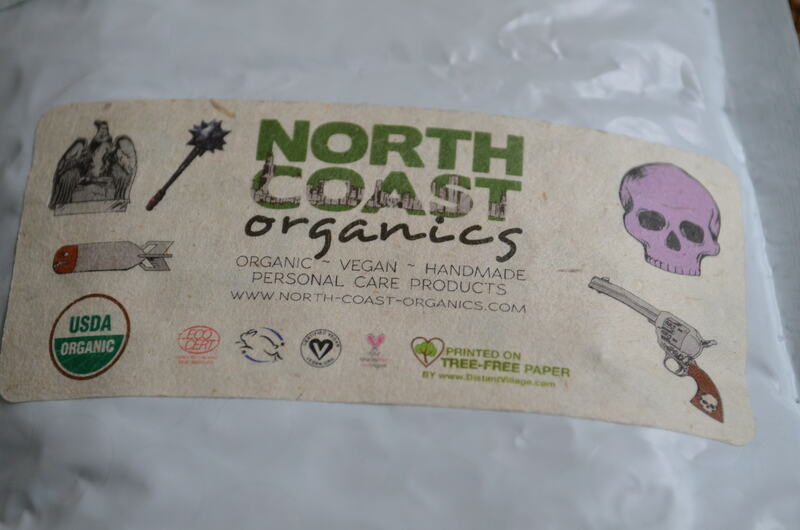 A couple of months ago I was lucky enough to receive two awesome products to review from North Coast Organics. 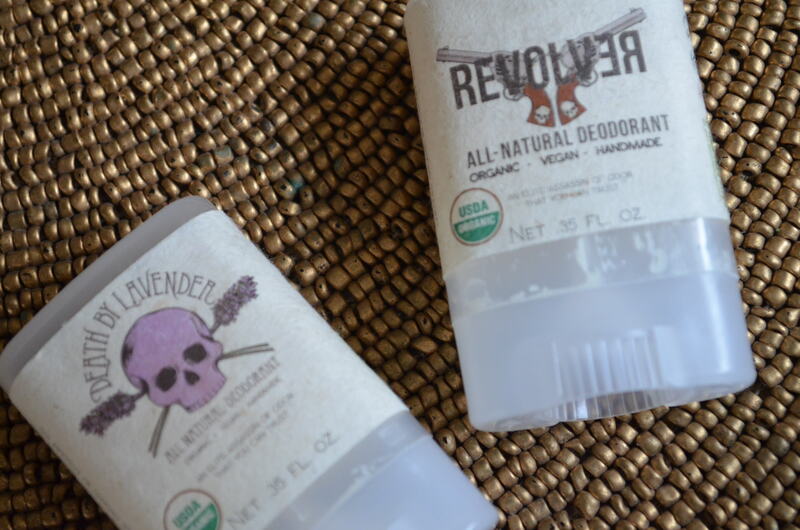 I got to try out Death By Lavender and Revolver, both vegan, organic and not tested on animals. I was super excited to see a new vegan deodorant. In the past, I have tried countless deodorants that work for the first hour until they ware off, leaving me trying to remember if I deodorized in the morning. I began to get lazy of going to the store and grabbing another deodorant that won’t work, so I just began using coconut oil. Which don’t get me wrong, worked, but didn’t have the smell I wanted. This right here, has coconut oil as a main ingredient but is also paired with essential oils and other ingredients to make sure your smelling fresh! Instantaneously, I could smell the aroma of essential oils when I opened it up. 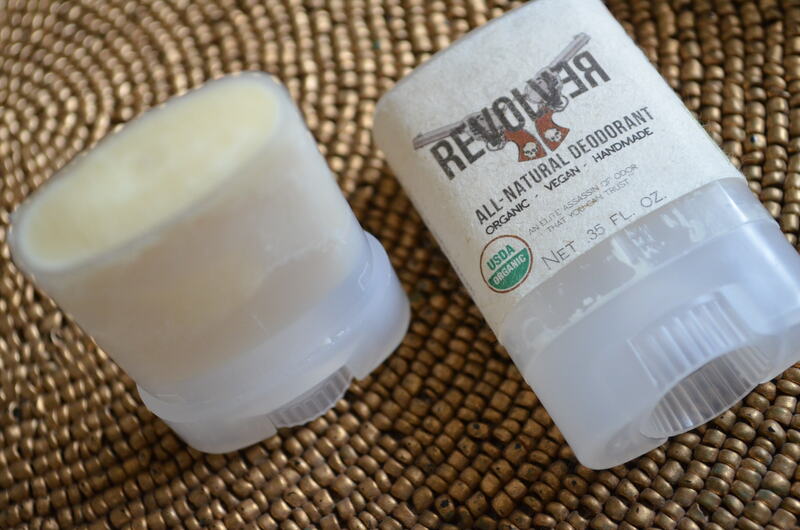 A vegan deodorant that smells good and works? Yes, it has finally been made. It glides on smoothly and leaves you fresh for hours. If your sweating a lot during the day, I would recommend throwing this in your bag and reapplying just to make sure your covered. My favorite part about this deodorant are the simple list of ingredients that you can actually read. I’m a sucker for a short ingredient list. Its really important to me to keep what goes in me vegan, but to also make sure I’m keeping every aspect of my life cruelty free. These deodorants are my favorite of all that I have tried. North Coast Organics have come up with the secret formula to save us all. f you haven’t tried this yet go get your hands on it. I swear by this product and I’m sure you will too! The sun has been shining and its so lovely to finally see the light again. Although, yesterday I got blown into school by a wind storm. Our weather here in New York has been hectic. One day its 65 the next its 15. Crazy. But soon (hopefully) it will be summer, and then I will no longer have to use frozen berries anymore. Getting to the meal…Sometimes I’m in a mood for something quick and easy with little time or effort. 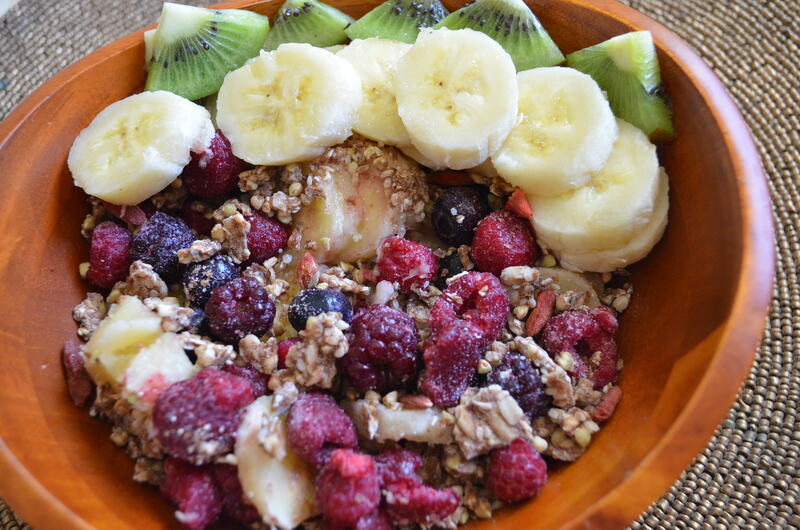 In this case granola with fresh ripened bananas, berries and kiwi sounded like a go too. The granola I’m using here is Go Raw’s Apple Cinnamon Granola. Their products are out of this world if you want something tasty and good for you at the same time! This granola tastes like an apple crisp pie with chunks of dried apples, buckwheat, and flax sweetened with dates and a ton of wonderful spices that bring it all together. I got lazy and decided instead of making my own buckwheat granola I could cheat a little. Since I had no almonds to make fresh almond milk I had to improvise. Heres what I came up with..
Thats it! As simple as that. The milk is so creamy and frothy and it compliments the other fruits so well. It leaves you satisfied and feeling good. This is such an easy meal/snack that you could even take on the go and just pack the “milk” in a bottle. Yum! Hope you all enjoy! I know I will be having this again soon…or everyday. Perhaps you follow me on instagram. It is very is easy to see my loving obsession for half melted, explosion of topped banana ice-cream. Since dipping my toes into the raw vegan waters, I have experimented with tons of different flavors and there is no way to ever get sick of it! Bananas have tons of health benefits, it is said they even cure depression! Pretty cool right? Need your mood lifted, snack on a banana…or two….or seven. Which in this case explains the ice-cream above. 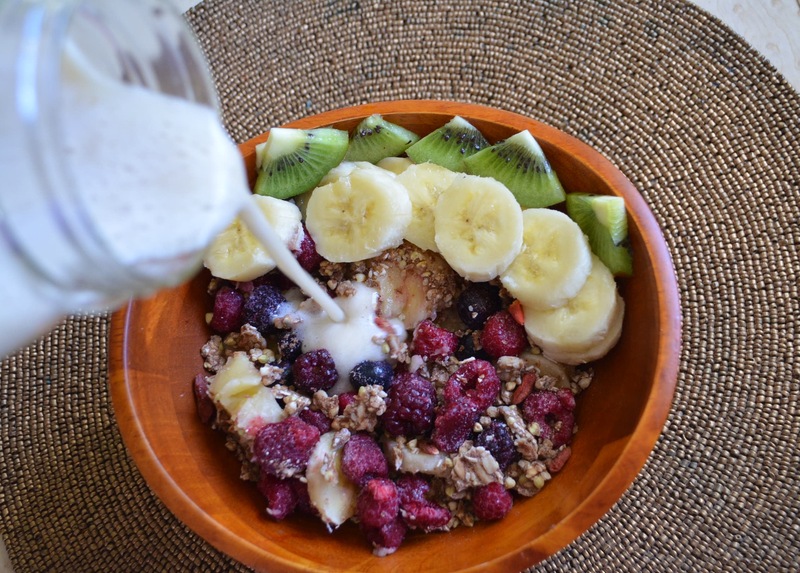 Put into a bowl and top with all sorts of delicious toppings! Sit down and enjoy, you will be left speechless & maybe a little cold depending on where you live. 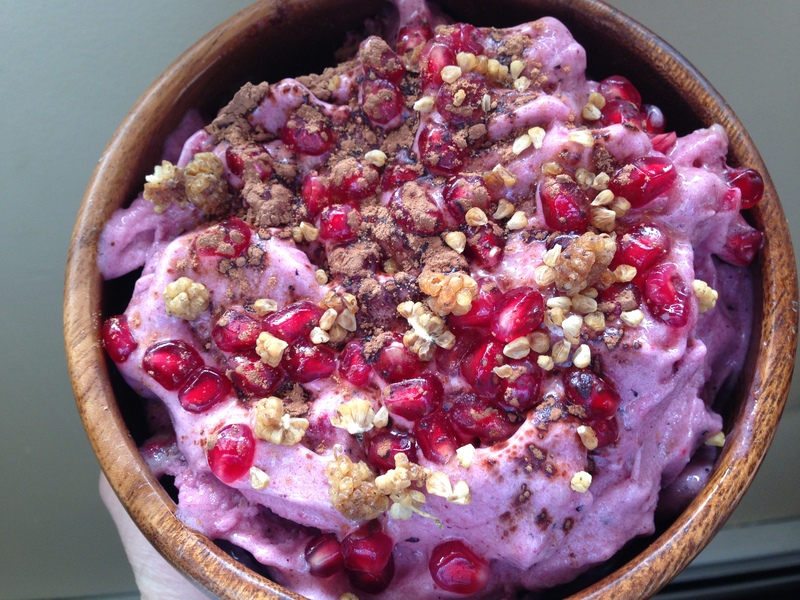 The superfood Acai, has tons of antioxidants, aids in increased energy, is said to increase metabolism and much more. Acai is a berry native to South and Central America. If you have never tried it, they are delicious. Especially in my favorite, the Acai Bowl. First you blend the frozen acai, frozen bananas and frozen mixed fruit. Here I blended it with coconut water, but you can use apple juice, orange juice or just water. Then after I blended this I put it in a bowl and then my favorite part. TOPPINGS! Here I used mulberry crumbles from Navitas Naturals (which I will be doing a review on some of their products soon). Mulberries are my new favorite superfoods that taste like yummy oatmeal cookies. I also topped this with Golden Berries, also from Navitas Naturals and fresh strawberries. So simple and so many combinations! Don’t you just want a bite? Well why don’t I start off by introducing myself? My names Deanna, I’m not really your typical 17 year old, I suppose. I was never the one to go out and party all night. Rather introverted, but thats something else to discuss. “Your vegan, so that means you just eat vegetable, right?” I’ve been asked this multiple times. It seems as if though half of the portion of high school students still don’t know what a vegan diet is. Any who, back to me. I live in New York, would never pass down an opportunity to go dine at my favorite spots in the city. Vegan of course, and your probably thinking of some places right now. My passion for yoga has been growing for well over a year now. It started merly for 20 minutes in gym, when we hit the yoga portion of class. It was a favorite time for myself and many others. In this moment, I felt no internal connection to it. But, in the past year struggling with internal battles, I searched for something, anything to relieve me of tensions that had built. It started with small stretches in my room, for a while in fact. Moving into poses, falling. Many times. Then, I began to take classes and it wasn’t until then that I came across the internal healing aspects of yoga. I now work at a studio near me and am looking forward to getting to start my teacher training next year. I believe that certain events in my life have occurred for a reason. So I can share my stories, whether it be through pictures, recipes, events. I want my story to be heard and instead of instinctively hiding, its time to be free and come out of my shell as I move into the next portion of my life. Come join me for the ride.